Be sure the basil is thoroughly washed, pluck all of the leaves from the stems. Blot the leaves dry. Put the basil, pine nuts and garlic into a food processor and pulse to get a coarsely chopped mixture. Add salt and pepper. I prefer to use either sea salt or Kosher salt. Add all remaining ingredients. Either pecorino or parmigiano will work fine. I’ve used each, depending on what I have on hand. Because I’ve spent a lot of time in Florence, I have a tendency to prefer pecorino because it is so predominant there. Then decide how smooth or coarse you’d like the texture of your pesto. For a coarser texture, pulse and use a spatula to push the mixture back down until you get the texture you want. For a smoother pesto, simply turn the food processor on. The pesto will keep in the refrigerator for three days. If you plan to freeze it, keep some of the olive oil to the side to pour on top of the pesto before you freeze it. It’s better to add the cheese after defrosting, rather than freezing with the cheese in it. A word about timing. Pasta water takes awhile to boil. I like to start my water well ahead of when I plan to drop the pasta in it. Same with heating the oven. If you start your water and oven while you are working on the pesto, then they will be ready to go. You could also season the salmon. If the water reaches a rolling boil before you need it, turn it down to simmer. It will quickly return to boiling when you raise the heat again. Salmon filet — cut in 6 to 8 ounce portions. Preheat oven to 400 degrees. Be sure it has really pre-heated to the correct heat. Bake in the oven at 400 degrees. A 6 ounce portion will need about 15 minutes. I always set a timer and check it at 12 minutes. How long it should cook is really dependent on: how thick the filets are, whether it’s wild caught or Atlantic, and your preference for how done you want your salmon to be. The thicker the filets the longer it will take. How much water? — 6 quarts per pound of pasta. A box of pasta is typically a pound. How much pasta? Follow the directions on your box of linguine. Typically a box of pasta will say it has enough to serve 8. You know the appetites of those you are serving — prepare enough pasta for the number you are serving. In this case, it is a side dish, not the main dish. Boil the linguine in salted water until al dente. It will take approximately 10 – 11 minutes. Once done, drain. I put individual quantities of pasta on plates, add a tablespoon of pesto and a handful of grated pecorino and toss it on the plates. 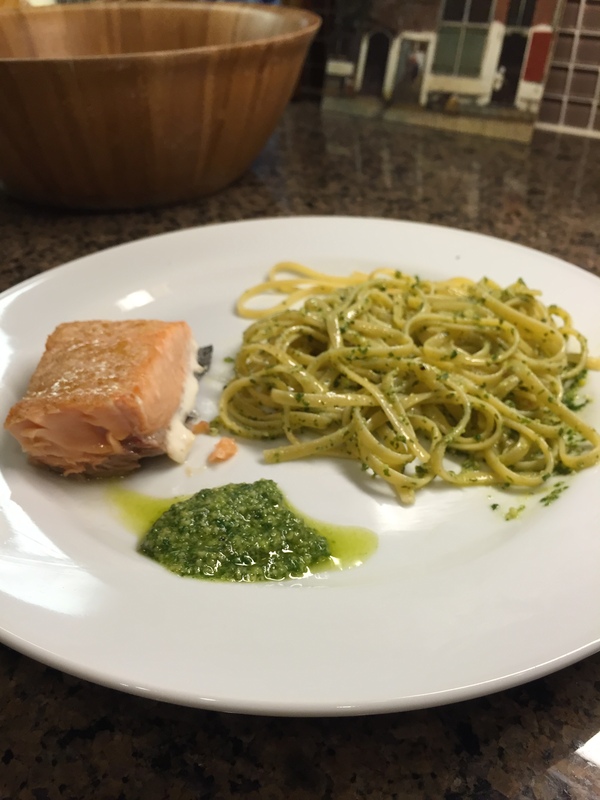 Then add a salmon filet, a tablespoon of basil next to the salmon. Groom the plates and serve with a nice salad on the side. The one thing that I find is that when I make pasta for a lot of people — I can’t toss all of it together and get the pesto spread through a big wad of pasta very effectively. It’s just never as good. So I like to work in smaller batches to toss, and this works well for me. As you turn around I take the opportunity to get a forkful of that delightful dish and shovel it quickly into my mouth. I try to look innocent when you turn back to me. Well, I think I’ve prepared enough for you, Sasquatch, and especially Elvis :-).